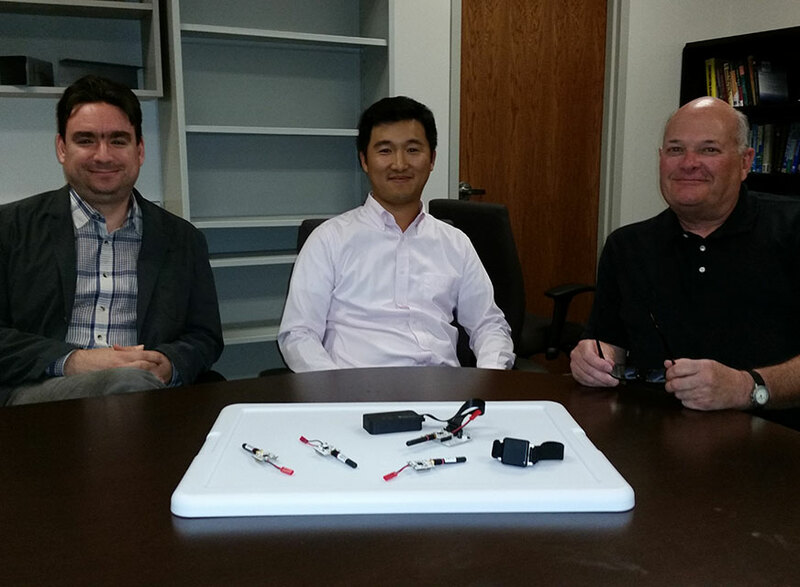 A team of UNL engineering faculty - Mehmet Can Vuran, associate professor of computer science and engineering; Changbum Ahn, assistant professor of construction engineering; and Terry Stentz, associate professor of construction engineering and management - is hoping to help make construction sites safer by studying the way construction workers interact with their job-site environments. Inspired by a former graduate student who is a construction contractor and iron worker, three UNL engineers are hoping their upcoming project will help make construction job sites safer. By revealing potential and hidden hazards in a changing environment and studying the behaviors of construction workers, Changbum Ahn, Terry Stentz and Mehmet Can Vuran are hoping to save lives and prevent injuries through a three-year, $350,000 grant from the National Science Foundation. Ahn, an assistant professor of construction engineering, said getting to know Cory Lyons made the project even more personal. Lyons, a general manager with Topping Out, Inc., of Davis Erection Co. in Lincoln, told the team tales of steel erection job-site hazards and spurred them to begin doing research. “He made it clear that the important thing is identifying the safety hazard on the job site and that the essence of this project should be trying to learn how humans react to safety hazards,” said Ahn. Identifying workplace hazards has traditionally fallen on human inspectors. But, Ahn said, those inspections aren’t always sufficient because some hazards aren’t easy to spot and the environment on job sites changes daily. “(Inspectors) can see physical dangers, but sometimes the hazards also can include interactions with a physical environment and a human worker’s behavior and those are often hidden,” said Ahn, an assistant professor of construction engineering. To better study the construction worker on the job site, the team will rely on the expertise of Vuran, an associate professor of computer science and engineering who has plenty of experience studying cranes – more specifically, using sensors to collect data about whooping cranes. To monitor the birds, Vuran and his team created some of the first avian wearable technology devices – backpacks that included an accelerometer, a gyroscope, a GPS and a magnetometer to measure the posture and movement of the cranes. The data gathered was transmitted through a cellular chip via a wireless provider. “We learned that the cranes are a little different than other migratory birds, they fly in families rather than flocks – two adults and a chick,” Vuran said. “Within that study, we were also looking at the behaviors of the birds. Combining field observations with the data we were getting, we were able to identify the behaviors of the birds. As with Vuran’s study of whooping cranes, this project will likely require innovation in the creation of wearable sensing devices and the software programs used to measure the behaviors of individual construction workers. “The technology we are hoping to develop has shown preliminary success in allowing us to tailor our algorithms to detect abnormal responses,” Vuran said. This, the team hopes, could lead to new training methods that could not only protect the workers, but also make construction projects more productive and less expensive. Stentz also said Lyons helped the team see much more than a cost benefit for construction companies. “We started this based on the workplace tribal knowledge and experience of Cory. He’s been an iron worker for 20 years and knows the work inside and out,” Stentz said. “He knows it’s not fun to work on a construction site when you’re worried about safety. If there’s a way we can improve how workers behave, control the hazards, lower their stress level and raise their confidence in the safety system, which pays off in fewer accidents and lower costs.